SYNOPSIS: In 14th-century Scotland, Robert the Bruce claims the crown and leads a fierce uprising to win back the country's independence from English rule. Mel Gibson’s Oscar-winning ‘Braveheart’ told the story of Scottish independence hero William Wallace fighting the English army, and if you ever wondered what happened afterwards, we finally have an unofficial answer in David Mackenzie’s historical drama ‘Outlaw King’. 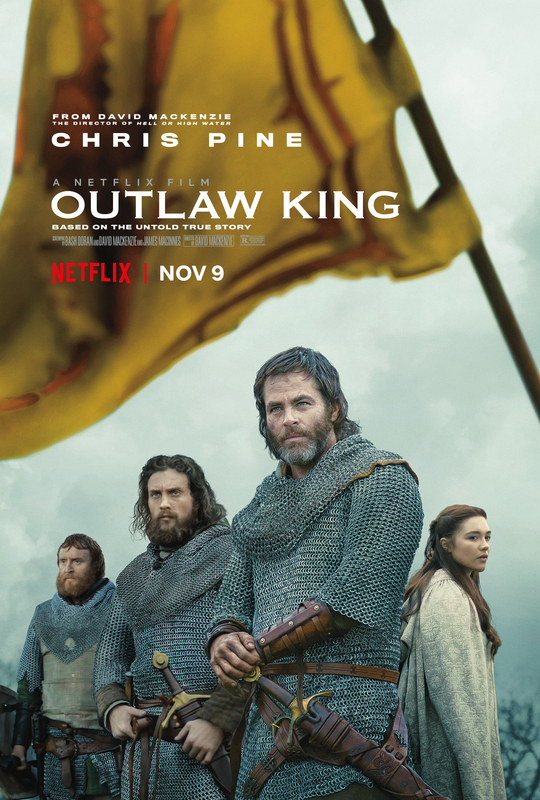 Whereas ‘Braveheart’ portrayed Robert the Bruce as a calculating but gutless politician who ultimately abandoned Wallace’s cause, ‘Outlaw King’ restores him as the venerated 14th-century freedom fighter who rallies the disparate clans within Scotland against the oppression of English rule. No matter that it is made by and is therefore debuting on Netflix, it is an epic in both size, scale and scope, and is often bold, bloody and brutal enough to match Gibson’s predecessor. Mackenzie’s ambition is evident from the get-go, opening with an impressive 9-minute single-take shot which introduces Robert the Bruce (Chris Pine) pledging fealty to King Edward I of England (Stephen Dillane) along with the rest of the Scottish lords, then engaging in a bit of swordplay with the King’s ill-tempered son Prince Edward II (Billy Howle), and finally being handed a warning as King Edward unleashes a massive flaming projectile from a gigantic catapult towards the castle of one of his enemies whom he refuses to accept the surrender of. It is a dizzying take all right, a demonstration of not only the extent of the choreography but also the achievement of top cinematographer Barry Ackroyd’s immersive camerawork, that brings gritty authenticity to Mackenzie’s lived-in world of mud, blood and viscera. For those familiar with Scottish history, the rest of the film covers the roughly three-year span up until the Battle of Loudon Hill, and not the crushing victory at Bannockburn. Even so, there is a lot of ground for Mackenzie, who co-wrote the script with Bash Doran and James MacInnes, to cover in Bruce’s rise to power as the King of Scots and the subsequent guerrilla rebellion he leads against England that his subjects are sick of. Among the long and complex chain of circumstances are the public display of the mutilated body of fugitive rebel Wallace, the death of Bruce’s Solomonic father afterwards, his subsequent disembowelment of the leader of a rival clan John Comyn (Callan Mulvey) who threatens to betray him, and his absolution by the clergy of the Church of Scotland on condition that he accepts their coronation as the King of Scotland. Oh yes, it is clear that Mackenzie has done plenty of detailed research for the movie, aiming as with his other movies for the highest degree of verisimilitude. It is to his credit that what could have been the material for a miniseries still flows coherently and propulsively as a two-hour feature, with some of the weighty exposition in the first half-hour purportedly trimmed down from the version which premiered at Toronto. Still, we’d wish Mackenzie had given the latter half of the movie more breathing space, so that we’d better appreciate how Bruce grew his army from 50 to 500 men as these rebels went from castle to castle killing the English soldiers stationed there, taking whatever they could and burning everything else to the ground. As it stands, these conflagrations feel a bit rushed, though you’d likely remember one chapel ambush designed specifically to allow Aaron Taylor-Johnson’s land-robbed noble James Douglas to unleash his pent-up rage against the occupying English forces. But Mackenzie saves the best for last, and the climactic battle is as bloodcurdling and violent as it gets, what with pikes skewering rows of men on horseback, plenty of hacking and slashing within knee-high mud bogs that the larger English army is ill-prepared for, and a mano-a-mano showdown between King Bruce and Prince Edward II that doesn’t end well at all for the latter. It is a rousing finish all right, and firmly rooted in today’s ‘Game of Thrones’ zeitgeist of grimy period warfare. Thankfully, the film never loses sight of its titular hero even when it aims for spectacle. Buoyed by an excellent performance by Pine, King Bruce remains an intimately felt character throughout the movie, convicted of his ideals of independence for his people but conflicted by the costs to those closest to him. Wisely, Mackenzie draws you into King Bruce with a tender and affecting love story between him and his English bride by arranged marriage Elizabeth de Burgh (Florence Pugh), that will also win you respect and admiration for both Bruce and his queen consort. Though arriving more than two decades after ‘Braveheart’, ‘Outlaw King’ is a fitting complement that completes the story of Scotland’s medieval battle for independence. Don’t listen to critics who have called this empty or meandering, neither of which in our opinion are accurate descriptions of a movie that belongs to be seen as much on the big screen as on Netflix. We enjoyed every minute of this handsomely mounted drama that also marks a triumphant homecoming for Scottish director Mackenzie, and we think you would too this beautiful epic that deserves as wide an audience as ‘Braveheart’..